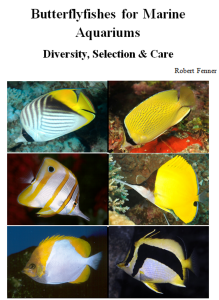 - Wound on Butterflyfish - Hi brilliant aquarists! Thanks a bunch for your help in the past. My fish only aquarium is working wonderfully thanks to you lot. Water is absolutely pristine (no traces of ammonia, nitrate, nitrite, pH = 8.3, specific gravity = 1.023). 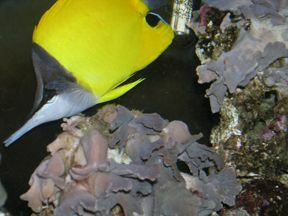 The tank is stocked with: 1. one 3.5" yellow tang 2. one 2" maroon clownfish 3. one 3" raccoon butterfly fish (picture included) 4. one 1" damsel (the blue one with a bright yellow tail) The question is the butterfly fish. 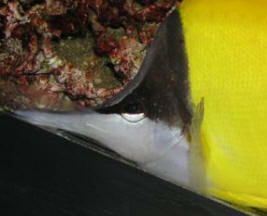 I notice on its right side near its fin is an abrasion of some sort (you can kind of see this in the picture attached). <I see.> It does occasionally rub the abrasion against the piece of dead coral I have in the tank. Is this something I should be concerned about? <Yes.> Is one of the other fish picking on it? <Could be, could also just be an acquired wound... but you need to make sure it doesn't get worse.> Also, the clownfish has been doing great except just a few days ago its dorsal fin looks like its been chomped on. <I'd blame the damsel.> The butterfly fish just came into this tank about two weeks ago (quarantined) - could it be picking on the clownfish? <Could be - is something you really need to sit down at watch for.> Regarding the damsel, lately it looks like it is picking stuff off of the tang's body. The tang gets close to the damsel, turns slightly to the side and lets the damsel pick at it. Is this normal?? <It's not abnormal - many juvenile fish act as cleaners.> Lastly, what do you all think about adding a niger trigger? <That would likely work out well in this tank... I wouldn't add much more.> What size would you recommend considering the sizes of the fish I already have. <Smallish - not much larger than anyone else.> The tank is 90gal. Thanks a bunch! Re: Help - what kind of fish disease is this? I checked water parameters: ammonia = 0 nitrite = 0 nitrate = 40 pH = 8 temperature = 82F alk = 3 meq/L as I haven't done water change for a while, I did a large water change (10g of 55g tank). I read your web site. It seems like some internal infection. I have antibiotics Furan-2 (for both gram-positive and negative) and a 10g hospital tank. But I am debating whether it's best to treat the fish: The fish <for browsers a Chaetodon auriga, Threadfin Butterfly> swims and eats fine, no other symptoms. Given the stress of catching it, moving a 4" fish to a 10g tank, and the danger of antibiotics killing biofilter and cause ammonia spike which could indeed kill the fish, is it better off just to stay in the main tank? <IMO yes> What's the chance of the fish fighting off this disease by itself? <Some... depends really on the root cause/s... your nitrate is a bit high, might be contributing to the problem... do you have live rock, some macro-algae you could place in the system to reduce this, improve water quality overall?> Please help me make this decision before it's too late. <I would do what was stated before: I would do your best to keep the >>system optimized and stable, and supplement this fish's foods with >>a vitamin and iodide preparation (such are made/sold for the >>purpose, or you can make your own). And add a biological cleaner. Bob Fenner> Thank you!